Unilever has bought US start-up Dollar Shave Club for a reported $1bn (£764m) in cash to compete in the male grooming market. The four-year-old e-commerce company sells disposable razors and other male grooming products directly to consumers for as little as $1 a month. 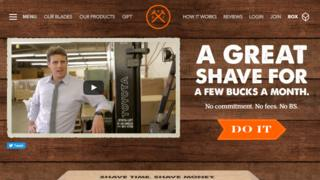 Dollar Shave Club has 3.2 million members - but has yet to make a profit. Founder Michael Dubin, who will remain as chief executive, said he was "excited" by the deal. His company came to global attention after he posted a humorous marketing video about shaving on YouTube. The video went viral, crashing the company's server within an hour. It now operates in the United States, Australia and Canada. But the company is facing legal action from rival Gillette, owned by Procter & Gamble, seeking unspecified damages. It claims that the coating used to strengthen its blades infringes on a Gillette patent. Since that YouTube video, Dollar Shave Club has taken a sizeable slice out of Gillette's market share. In response Gillette introduced its own Gillette Shave Club last year. Now the Anglo-Dutch multi-national Unilever wants to use Dollar Shave Club's "innovative and disruptive male grooming brand" to compete with Gillette head on. Unilever already has a foot in the male grooming market with the Axe brand, known as Lynx in the UK. "We plan to leverage the global strength of Unilever to support Dollar Shave Club in achieving its full potential in terms of offering and reach," said Kees Kruythoff, president of Unilever North America. Dollar Shave Club, which now also sells male personal wash, skincare and hair styling products, logged $152m in turnover last year and is "on track" to exceed $200m this year. The firm was valued at around $615m following its latest venture capital funding round in November.